High diving and border crossing: This week in pictures. 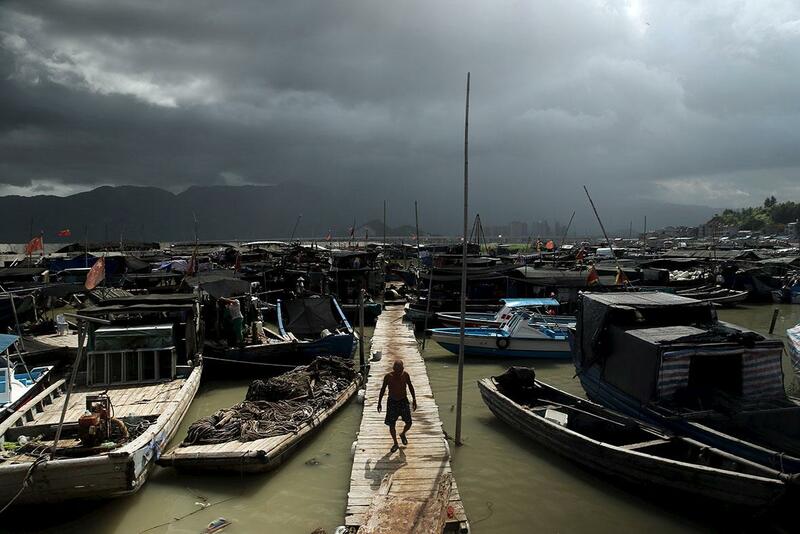 A fisherman walks on a port as Typhoon Soudelor approaches in Fujian Province, China, on Aug. 7, 2015. Taiwan evacuated hundreds of people from their homes on Friday as the strongest typhoon to threaten the island in two years churned toward it and was expected to make landfall early on Saturday. 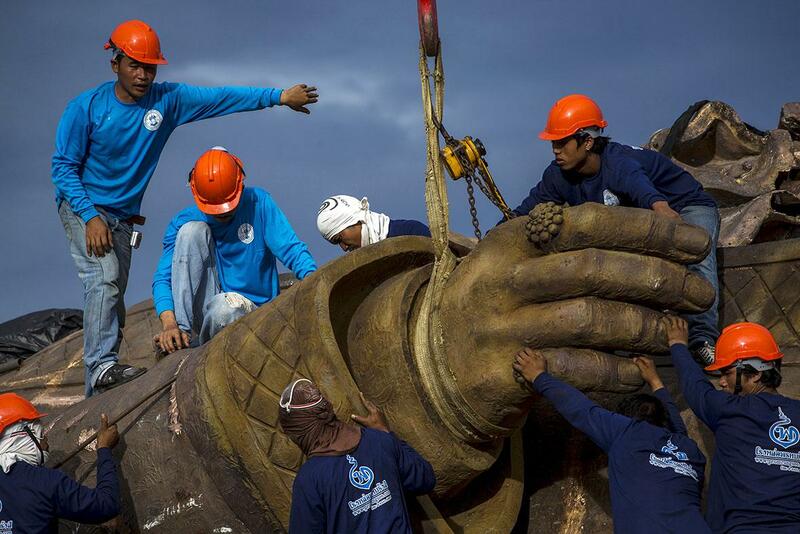 Laborers use a crane to lift a hand of the giant bronze statue of former King Rama I at Ratchapakdi Park in Hua Hin, Prachuap Khiri Khan Province, Thailand, on Aug. 4, 2015. The park is being constructed by the Thai army to honor past Thai monarchs and is situated on an army compound near the Klai Kangwon Palace. 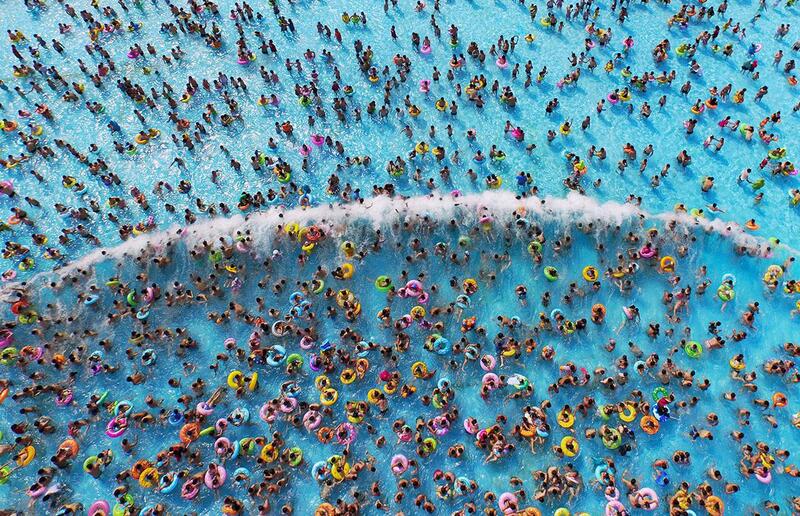 People cool off at a water park in Jiangsu Province, China on Aug. 1, 2015. 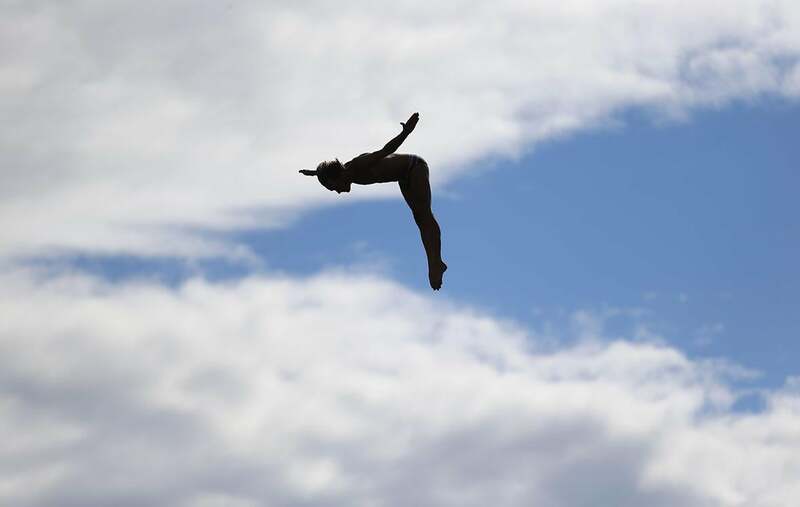 Gary Hunt of Britain performs during the men’s 27m High Diving competition final at the Aquatics World Championships in Kazan, Russia, on Aug. 5, 2015. A goat caught by villagers is tethered after being thrown by Hindu worshippers at the foot of Mount Bromo during the Yadnya Kasada Festival on Aug. 1, 2015 in East Java, Indonesia. The festival is the main festival of the Tenggerese people and lasts about a month. 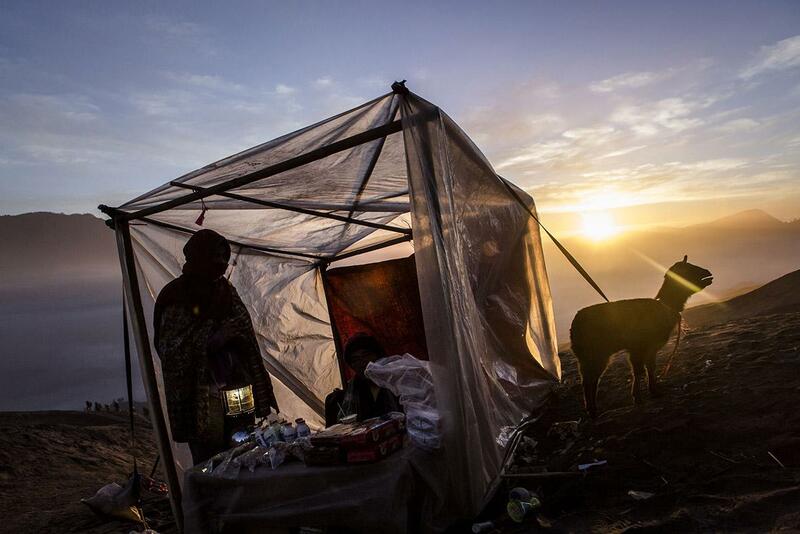 On the 14th day, the Tenggerese make the journey to Mount Bromo to make offerings of rice, fruits, vegetables, flowers, and livestock to the mountain gods by throwing them into the volcano’s caldera. 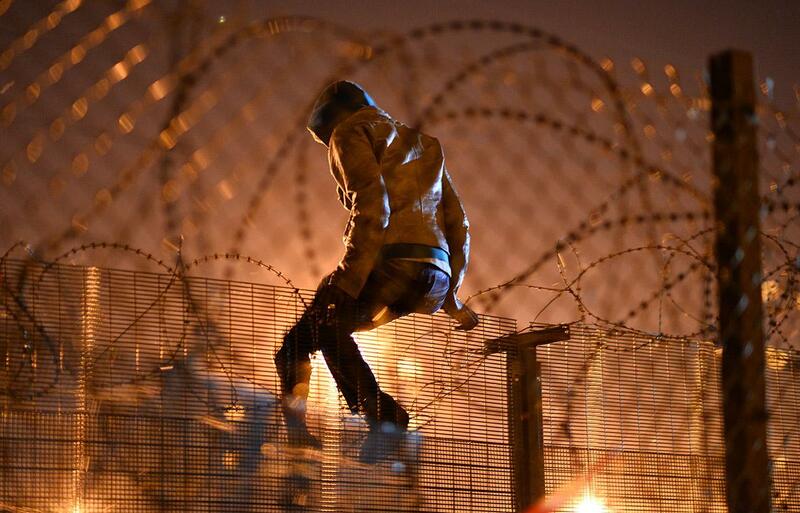 A migrant attempts to climb a security fence near refugee camp of Calais, France on Aug. 3, 2015. More than 2,000 migrants are residing in the forests of Calais, hoping to eventually get to Britain. 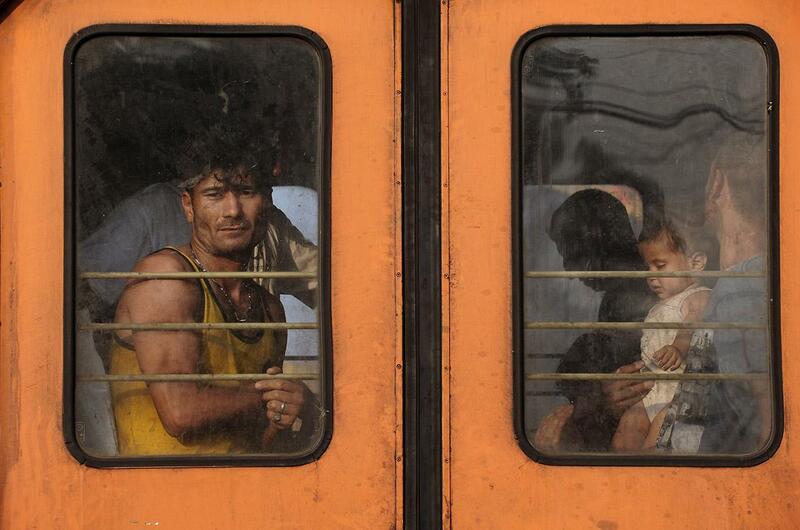 Migrants sit on a train at Gevgelija train station in Macedonia, close to the border with Greece, on Aug. 2, 2015. Tens of thousands of migrants, mainly from the Middle East and Africa, use the Balkans route to get into the European Union, passing from Greece to Macedonia and Serbia and then to Western Europe. After walking across the border into Macedonia to the small local station of Gevgelia, migrants pile onto an overcrowded four-carriage train in sweltering heat, young infants among them, to travel about 200 kilometers north, with the hope of crossing the border into Serbia on foot. 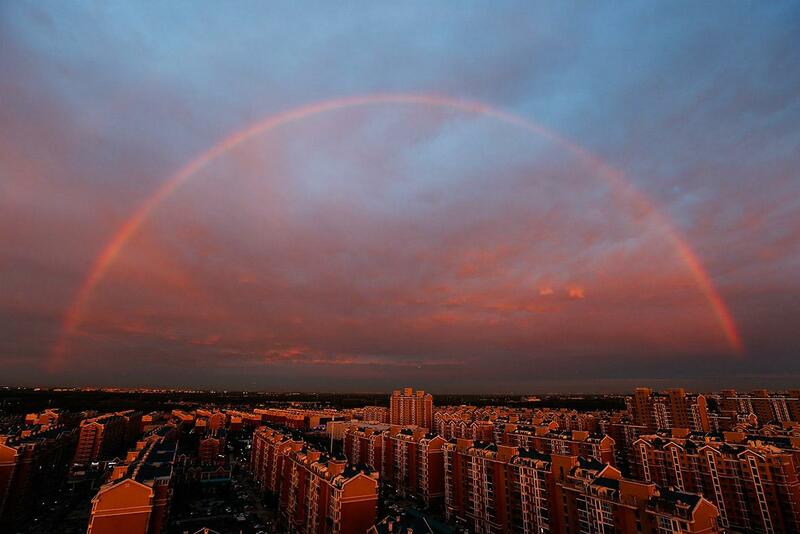 A rainbow appears over Beijing on Aug. 3, 2015. 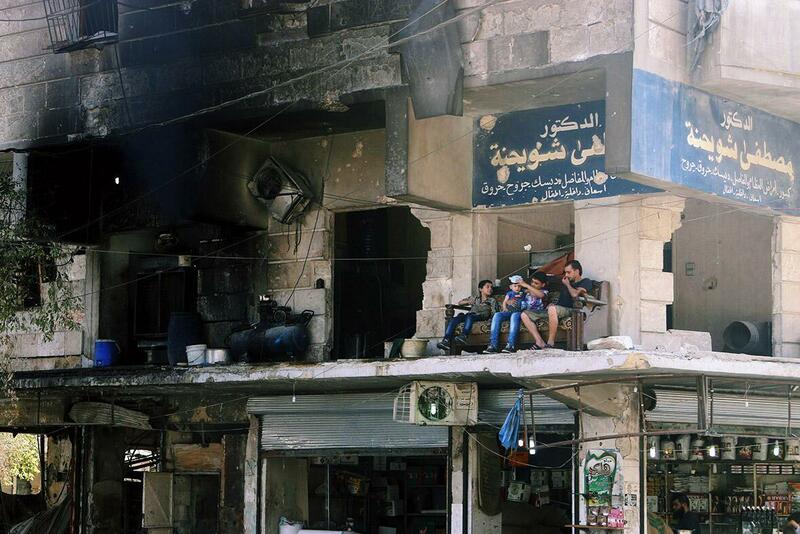 Residents sit on a couch on a balcony of a damaged building in Aleppo’s al-Shaar neighboirhood, Syria, on Aug. 1, 2015. 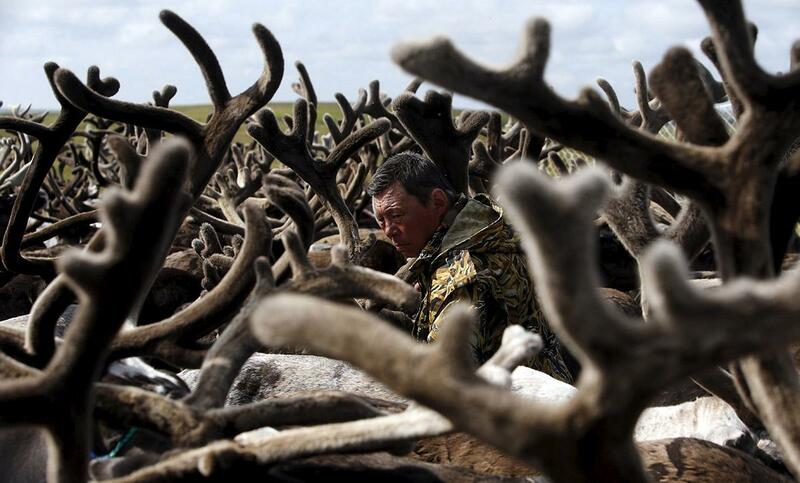 A herder is seen amid antlers while working with reindeer at a camping ground, some 124 miles northeast of Naryan-Mar in far northern Russia, on Aug. 2, 2015. People, including local herders and members of their families, gathered at the site to mark Reindeer Day, a professional holiday of reindeer breeding workers, which is celebrated annually. 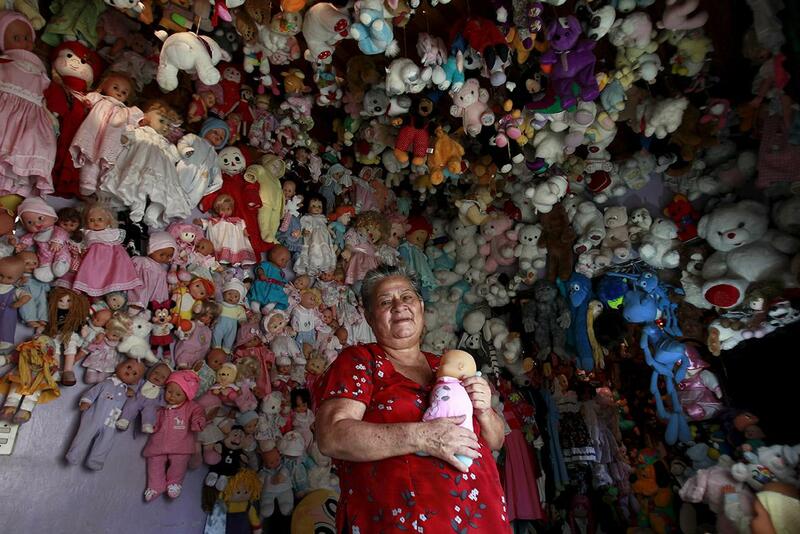 Andrea Rojas, 70, poses with her collection of dolls at her home in Heredia on Aug. 5, 2015. Rojas has been collecting dolls for more than 20 years and has more than 4,500 of them. 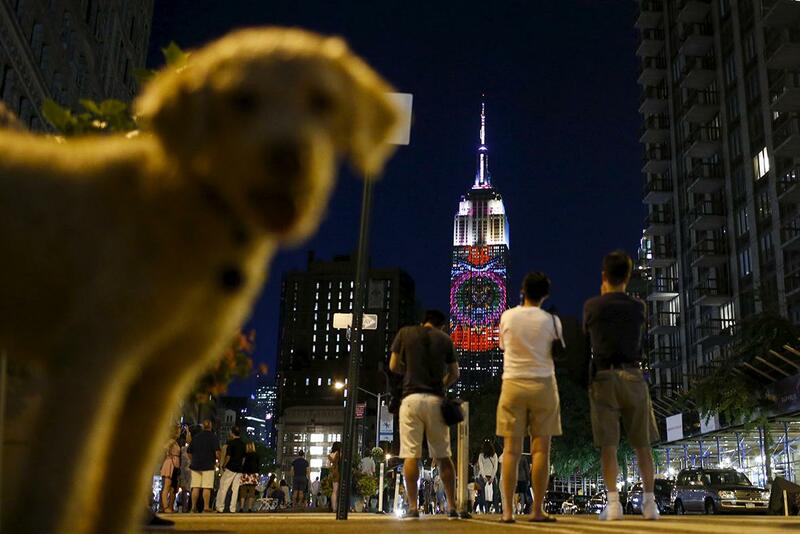 A dog passes by as people watch images of endangered species being projected onto the Empire State Building in New York City on Aug. 1, 2015. 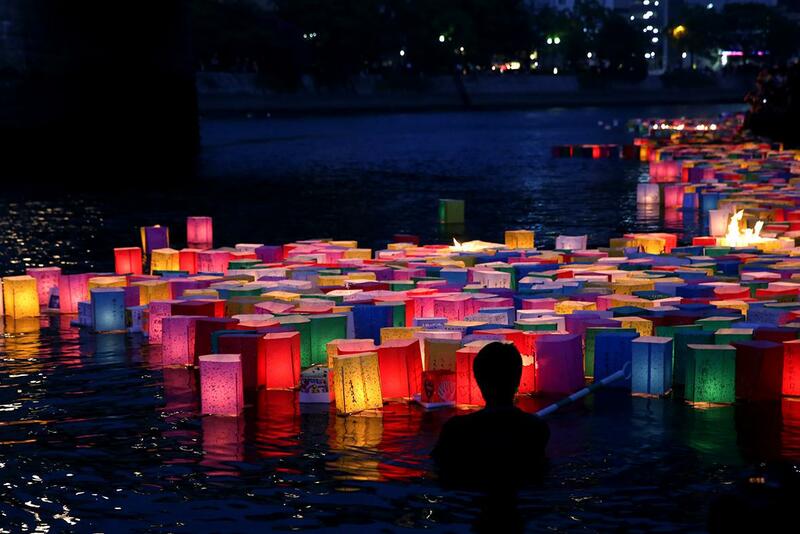 A man floats peace messages written on paper lanterns along the river during the 70th anniversary activities commemorating the atomic bombing of Hiroshima, at the Hiroshima Peace Memorial Park on Aug. 6, 2015 in Japan.